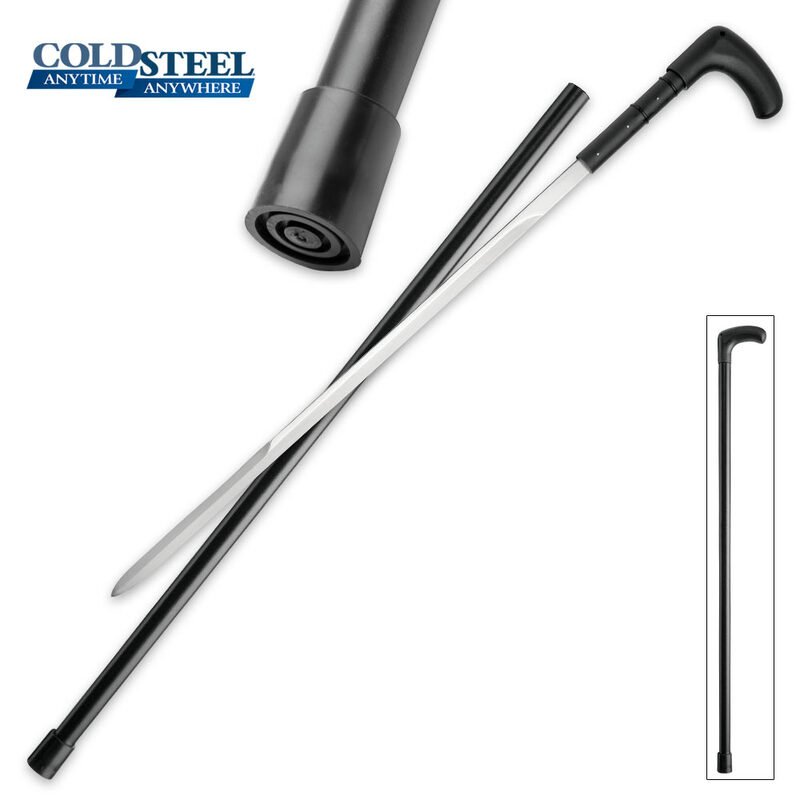 Cold Steel Heavy Duty Sword Cane | BUDK.com - Knives & Swords At The Lowest Prices! This appealing sword cane is as stylish and fashionable as it is functional! 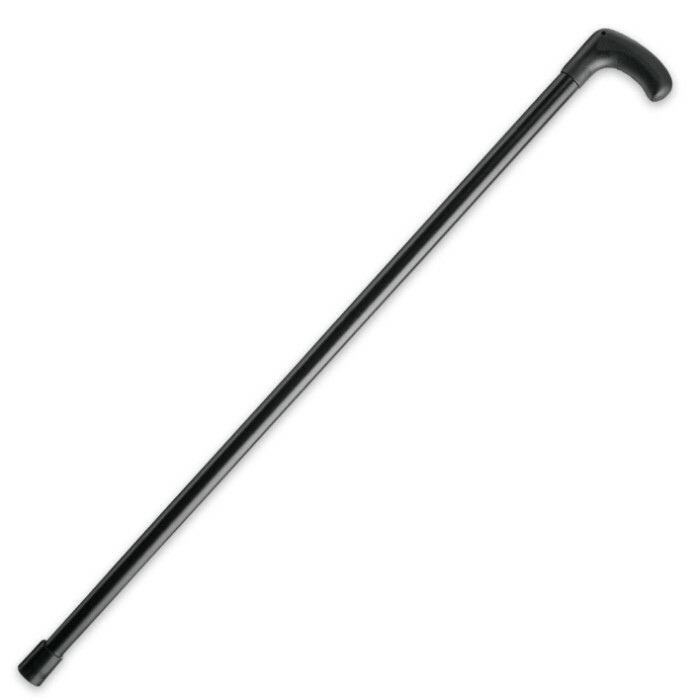 This heavy-duty sword cane features a strong, partial crook handle constructed of heavy-duty nylon, with a black, aluminum shaft that is heat-treated and 5.5 mm thick. 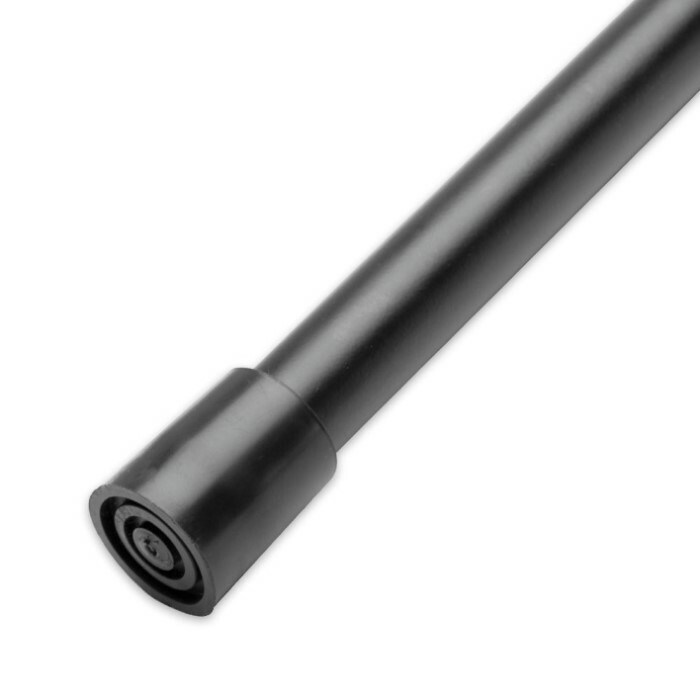 The shaft is tapered and features a thick rubber end for traction on icy sidewalks and uneven surfaces. The blade is constructed of stainless steel and it is sharp enough and strong enough to take down any attacker. This is a superior example of a sword cane! This cane is awesome. Just the right length and a little heavy but I like them like that. More sturdy. The handle is a little small but useable. The rubber tip is too slippery on some flooring surfaces like tile and other smooth surfaces. I want to change the rubber tip but it's very hard to get off for me. Other than that it's great. Sword blade is very sharp and not too heavy but sturdy. Good peace of mind for us oldsters. If you want a sturdy cane with a little extra weight (the blade) this is great. I had to cut the sheath down because I'm short but other than being a little rattled it is great. I have two of them and carry my spare in the car. I initially purchased a Kit Rae Axios forged sword cane. I choose it over the Cold Steel Heavy Dury because of the heavy handle and locking scabbard for situations where striking with the handle would be needed. But after just 2 weeks of use... It started falling apart. However, Budk with it's superb customer service .exchanged it without question for this one at no cost to me. I was looking at the Knight Watchman heavy duty but had read that SK5 carbine (which is around 1080 carbine steel) is not desired for sword material due to it being less flexable than lower carbine steel making it more brittle but is excellent for knife building and able to maintain a super edge. So this brought me back to the Cold Steel Heavy Duty with it's 1055 carbine blade. (1060 cabine is the optimal for swords.) As stated in other reviews the tip is made of plastic and is slick on some surfaces. The reason I think is that this cane is designed as a weapon first in mind. A soft rubber tip would not be as durable as the plastic one for striking. The tip is also glued in place for durability plus the scabbard has a drain tube that goes through the tip so if the tip wasn't glued in place and rigid...the tube would dislodge from the hole in the tip. But I sacrificed durability for functionality and cut off the tip (which took some effort with a sharp box cutter and a small flat tip screwdriver) and replaced it with a 7/8" rubber tip and now it is perfect. The blade is wicked sharp straight out of the box. The "O" rings are in great shape and allows for easy withdrawal of the blade from the scabbard. If the scabbard is as tuff as a demo video I saw of the Knight Watchman Heavy Duty where the guy was wacking the crap out of stuff with the scabbard without warpage, this will be an awesome weapon. Just don't trust weilding it for a handle strike because the blade will come out of the scabbard. Very pleased with it and would recommend it without hesitation. Pretty much what others say. Mine came with fine o rings, others say theirs came in bad shape, but mine were fine. More stabby than slicey, but it slices cardboard box well. You may want to check state laws before carrying it around. Feel much better put together than a wall hanger. I bought one of these canes, years ago I maintain it about once a month and haven't had a problem yet with it. I keep it next to my bed, when I am not using it. Only issue is the rubber toe. It's very rigid and is prone to slip. Other than that it's perfect, would buy again if I ever need one. Excellent blade. Also wonderful cane for a disabled veteran. I hope I will never need it but glad I have it and have other cold steel blades that are awesome too. James Grcevich. Love this one. Combat ready. The grip survived a Staffordshire terrier that loved plastic. Once again budk and cold steel delivers another great item. It was shipped to my home in 4 days. This sword came sharp and it's very sturdy happy marine corp bday to me. Nice cane and looks very durable but the guy in the video needs to hit the gym.